This book was written in 2000. Dan Southerland has been the pastor of Flamingo Road Church in Ft. Lauderdale, Florida for over twenty years. He also has been a facilitator for Rick Warren’s Purpose Driven ministry of changing churches from traditional to contemporary. Warren writes the Forward and encourages all pastors to read the book and to buy a copy for every staff person. With 500,000 churches in Warren’s network with multiple staff, that alone would boost the sale of the book considerably. This book is the result of a series of messages that Southerland preached to his church on the book of Nehemiah. 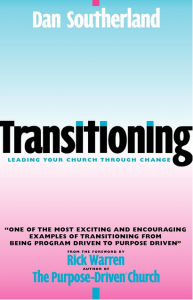 He proposes eight steps in transitioning your church into a contemporary, Purpose Driven model. These eight steps have been on Warren’s website for years. Southerland does the typical (and by now old and worn out) scenario of seeing traditional churches as boring, ineffective, not caring about lost people, resistant to change, etc. He includes the standard things that are necessary if a contemporary church is to grow: contemporary music, a casual atmosphere, an unchurch-like service, and more interaction with less “preachy” preaching. Warren and Southerland propose to change the church from what they perceive to be program driven churches to purpose driven churches. The book is filled with other predictable arguments and pretexts that have been refuted but have stayed around for years. A sad commentary.